As the weather deteriorates and the passengers are forced to choose sides in a brewing power struggle, Grace realizes that her survival could depend on whether she backs the ruthless but experienced John Hardie or the enigmatic but increasingly forceful Ursula Grant. Over the course of three perilous weeks, the lifeboat passengers plot, scheme, gossip and console one another while questioning their deepest assumptions about goodness, humanity and God. It is the summer of 1914 and Europe is on the brink of war, but Grace Winter’s future finally seems secure as she and her new husband set sail for New York, where she hopes to win over a disapproving and status-conscious mother-in-law. 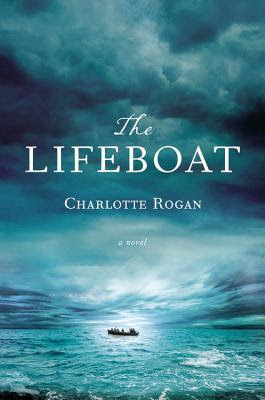 When a mysterious explosion sinks their ship, Grace is thrust into a lifeboat by a quick-witted crew member, who climbs in after her even though the boat is already filled beyond capacity. Grace is finally rescued, only to be put on trial for her life. Unsure what to make of their client, Grace’s attorneys suggest she write her story down. The result is a page-turning tale of moral dilemmas, and also a haunting portrait of a woman as unforgettable and complicated as the events she describes. Author Charlotte Rogan wisely starts her story in the middle of the action. Readers meet Grace Winter, twenty two, a bride of ten weeks, and a widow for almost 6 weeks. Grace is being escorted from the courtroom, where she is on trial for murder. As her attorneys lead her to a nearby restaurant for lunch, a rain storm opens up and Grace greedily stands in the downpour, allowing her mouth to open and swallow up the drenching rain, much to the embarrassment of her lawyers. This prologue tells us so much, and yet so little. What Rogan has brilliantly done is make us want to know more. Whew! Let me start by saying that I read this in two sittings. Over two days. I was so hooked on Grace Winter that my "real world" was put on "pause" so I could read this brilliant first novel! I won't give anything away that the publisher doesn't reveal in the synopsis or the author in the prologue. We know that Grace and others do survive the explosion and subsequent sinking of the luxury liner, the Empress Alexandra, taking place two years after the loss of the Titanic. We know some in her lifeboat do not survive. What we will find out - is who survives and why some do not. As we meet the passengers in the over crowded lifeboat, we see the struggle for life over death, and the struggle of death to bring life. Break out author Charlotte Rogan has crafted a story so simple, but with so many layers that you are hypnotized by its telling. Not a miss step that I could find in this story, and I will add that I think it's interesting that we know a lot more about the women passengers than we do about the men. Rogan gives us what we need as far as character development. Not too much, just enough to care and to keep us turning the pages. A HUGE 5 out of 5 stars!! Be sure to visit the author's website for more information about The Lifeboat. *This book was provided to me by the publisher through Net Galley and in no way affected my honest review.